Designed for multiple use, these gauges are made for insertion in tapped els, tees or other NPT fittings and are easily installed and removed with a wrench. 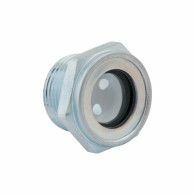 Turned from solid hexagon rod, this rugged unit comes factory assembled with clear glass window firmly held between two gaskets by rolled edge of body. Same as BW-10 with the addition of a white reflector to show oil level more clearly.